RAM KISHAN GOPAL DASS +91-9810030185 Established in Jan, 1974, Ram Kishan Gopal Dass is a name to reckon with in the domain of Steel & other Hardware Products in Hauz Qazi, Delhi. As a reliable Supplier, we offer Steel Products such as Industrial Steel and Metal Coils & Fastener products such as Self Drilling Screw, Dry Wall Screw and various type Fasteners. With years of experience and expertise in the field, our CEO, Mr. Vijay Kumar Gupta, & their Sons Nitin & Ankit Gupta has taken the company over towering heights despite of many obstacles. Quality Assurance We have quality auditors who consistently work towards bringing out the best product for the customers. Our quality products are highly competitive and have therefore set benchmarks in the industry. In order to continue this, regular and stringent checks are conducted at every stage of procurement to packaging at our unit. Customer Satisfaction Adopting a culture where customers and their queries are given lot of preference has been very fruitful to us. Our belief that customer satisfaction should be given utmost priority has earned us trust and high reputation in the market arena. Team We have an enthusiastic team of proficient managers, skilled and unskilled workers, administrators and quality auditors who are always keen to transform challenges into opportunities. Their consistent hardwork has enabled delivering quality products to the customers. A solution-oriented approach is strictly followed where we bring out innovative solutions for the problem. Why We? We strive to keep our customers on the leading edge - now and in future. We source raw material from the leading manufacturers in the India and the world and supply it to the foremost industries & customers in India and world. We assure a good quality of products with the customer as per requirements. We always try to live up a little higher than our customer's expectations. No quantity too big or too small to deliver. No customer too big or too small to service. We also serve requirements which are small in quantity and thus can not be imported individually. We can also arrange a huge order of greater than 1,000 MTs. of Special Steels and High edge Alloy Steel. 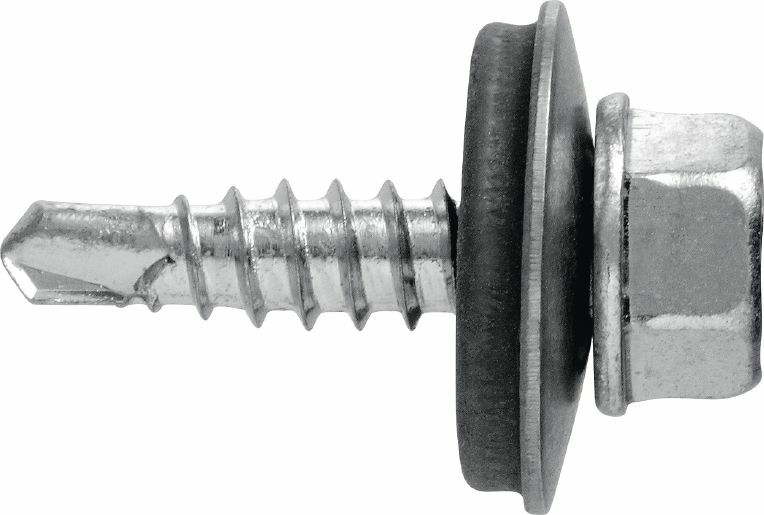 Self Drilling Screw Hex Head 12 (5.5) x 25 (1") with Steel Bonded EPDM Washer Self Drilling Screws can save labour, Drilling hole, Forming mating thread and Clamping home can achieve in an easy operation. It doesn’t require for difficult alignment of two or more elements. Self drilling screws can save materials. It only needs one tool for application screw drive. Power drills, drill bits and elaborate and costly press tools and their maintenance are eliminated. Self drilling screws can improve product quality. It ensures correct hole size every time, resulting in better thread engagement and tighter clamp.